Analysis of the mitochondrial structure-function relationship is required for a thorough understanding of the regulatory mechanisms of mitochondrial functionality. Specific methods for studying mitochondrial structure and function in live and fixed Drosophila ovaries are described and demonstrated in this paper. Parker, D. J., Moran, A., Mitra, K. Studying Mitochondrial Structure and Function in Drosophila Ovaries. J. Vis. Exp. (119), e54989, doi:10.3791/54989 (2017). Analysis of the mitochondrial structure-function relationship is required for a thorough understanding of the regulatory mechanisms of mitochondrial functionality. Fluorescence microscopy is an indispensable tool for the direct assessment of mitochondrial structure and function in live cells and for studying the mitochondrial structure-function relationship, which is primarily modulated by the molecules governing fission and fusion events between mitochondria. This paper describes and demonstrates specific methods for studying mitochondrial structure and function in live as well as in fixed tissue in the model organism Drosophila melanogaster. The tissue of choice here is the Drosophila ovary, which can be isolated and made amenable for ex vivo live confocal microscopy. Furthermore, the paper describes how to genetically manipulate the mitochondrial fission protein, Drp1, in Drosophila ovaries to study the involvement of Drp1-driven mitochondrial fission in modulating the mitochondrial structure-function relationship. The broad use of such methods is demonstrated in already-published as well as in novel data. The described methods can be further extended towards understanding the direct impact of nutrients and/or growth factors on the mitochondrial properties ex vivo. Given that mitochondrial dysregulation underlies the etiology of various diseases, the described innovative methods developed in a genetically tractable model organism, Drosophila, are anticipated to contribute significantly to the understanding of the mechanistic details of the mitochondrial structure-function relationship and to the development of mitochondria-directed therapeutic strategies. Mitochondria are classically described as the cellular powerhouse, since they are the main seats of energy production in differentiated cells. Moreover, mitochondria play a critical role in metabolism, heat generation, lipid modification, calcium and redox homeostasis, the orchestration of cell signaling processes, etc1. Mitochondria also play an active role in the induction of cell death2, as well as in cell cycle regulation3. Such multi-functionality raises the following fundamental questions: a) how do mitochondria perform all these functions simultaneously and b) are there specific mitochondrial pools or subzones that are specialized for distinct functions? In this context, it is important to note that the multifunctional mitochondria are dynamic in their shape, size, and structure within individual cells and that the steady-state shape of mitochondria can vary between cell types. Decades of research from various laboratories suggest that the alteration of mitochondrial shape, size, and structure, collectively called mitochondrial dynamics, is crucial for maintaining various mitochondrial functions4,5,6. These findings raise the possibility that mitochondria may accomplish their multi-functionality by virtue of their structural dynamism. Extensive efforts are underway to understand the mitochondrial structure-function relationship. The dynamism of mitochondrial structure is primarily maintained by their ability to undergo fission and fusion events with each other. Fission of large mitochondria converts them into smaller mitochondrial elements, while fusion between two smaller mitochondria merges them into a larger mitochondrial element7. Moreover, transient fusion of two mitochondria may occur to allow the mixing of their contents. The fission and fusion events of the inner and outer mitochondrial membranes are carefully governed by specific sets of proteins. The core fission machinery is composed of dynamin-related protein 1 (Drp1), which is recruited from the cytosol to the mitochondria by its interaction with certain bona fide mitochondrial proteins (e.g., Fis1 or Mff1), while Drp1 function can also be regulated by other proteins on the mitochondrial surface4. Although Drp1 operates on the outer membrane, its fission abilities impact the inner membrane as well. The orchestration of the fission of outer and inner mitochondrial membranes is not well understood. On the other hand, fusion of the inner membrane is governed at the core by the activities of Opa1, while mitofusins govern the fusion of the outer-membrane5. The balance of the counteracting fission and fusion events of mitochondria dictate the steady-state mitochondrial shape in a cell. For example, repression of mitochondrial fission would result in complete and unopposed fusion, while the over-activity of mitochondrial fission would result in fragmentation of mitochondria3. The study of the mitochondrial structure-function relationship primarily involves two complimentary approaches: a) analyses of the cellular and organismal phenotypes after genetic manipulation of mitochondrial fission/fusion proteins and b) direct assessments of mitochondrial structure and function. It is noteworthy that genetic analyses may not always reveal the direct functionality of the molecule at hand (in this case, mitochondrial fission/fusion proteins), as the phenotypes may arise due to secondary effects. Therefore, it is of the utmost importance to develop and use tools to study mitochondrial structure and function directly. Any assessment of mitochondrial structure involves various microscopy tools. Use of fluorescence microscopy of live cells has greatly advanced the studies of mitochondrial dynamics, since mitochondrial dynamism can be monitored both qualitatively and quantitatively using the appropriate fluorescence microscopy tools and techniques8. Fluorescence microscopy-based tools have been developed to study mitochondrial structure and function in live and fixed Drosophila melanogaster tissues, elucidating the significance of mitochondrial dynamism in vivo9. These and related methods are described here, with the goal of studying mitochondrial structure and function in the Drosophila ovary. The Drosophila ovary consists of germline and somatic lineages, which arise from their respective adult stem cells that reside in the germarium10,11. 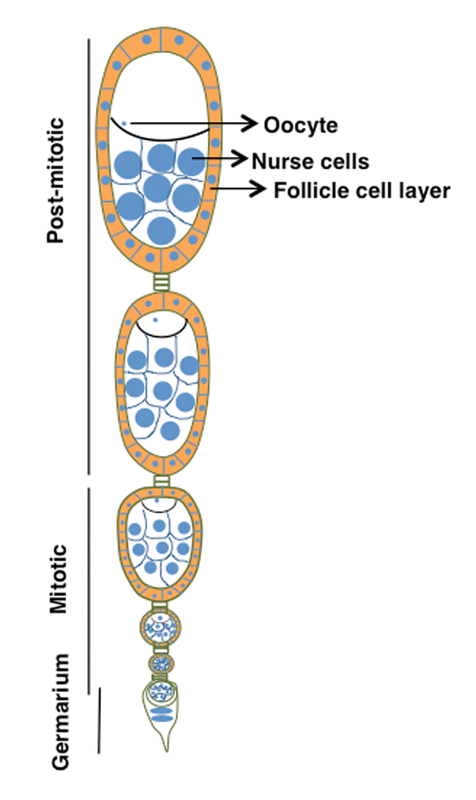 Sixteen syncytial germ cells (GCs) get encapsulated by somatic follicle cells (FCs) to form individual egg chambers that emerge out of the germarium (Figure 1). One of the 16 GCs get committed to become an oocyte, and the remaining 15 GCs develop into nurse cells that support the growth of the oocyte chamber, facilitating the maturation of the egg before it is laid. The majority of the FCs undergo 9 rounds of mitotic divisions before they exit the mitotic cell cycle to terminally differentiate into a patterned epithelial cell layer consisting of anterior follicle cells (AFCs), posterior follicle cells (PFCs), and main body cells (MBCs). The consecutive egg chambers are connected by stalk cells, which are differentiated cells that are also derived from the FCs early in development. Mitochondrial shape regulated by the mitochondrial fission protein Drp1 is actively involved in the process of differentiation during the normal development of the Drosophila ovarian FC layer9,12. The methods used in these studies to identify the involvement of Drp1 in Drosophila follicle cell layer development are described here. For any of the experiments described, collect Drosophila (maintained at room temperature, or 25 ºC) within 5 days of eclosion and place them in a vial filled with 5 - 7 mL of Drosophila food (see Materials Table), with no more than 25 flies in each vial; maintain a female:male ratio of 2:1. Sprinkle a small amount of granulated yeast to stimulate Drosophila egg production. 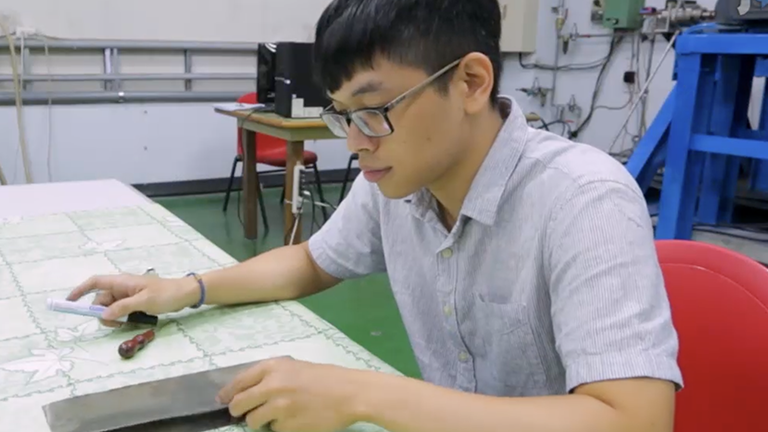 Perform experimental manipulation within 2 - 4 days. Warm insect dissecting medium (see Materials Table) to room temperature, 25 °C. Fill three wells of an eight-well glass dissecting dish, with 200 µL of medium in each well. Anesthetize Drosophila with CO2 by placing the needle of the blow gun under the vial plug. Place them on a fly pad. Using a dissecting microscope, sort out 5 females and place them in the first well of the dissecting dish. Handle one Drosophila at a time when performing live microscopy. While looking through the eyepiece of the dissection microscope, sever the thorax from the abdomen using two pairs of forceps. Using the forceps, carefully transfer the abdomens to the second well of the dish. Use one pair of forceps to hold the abdomen at the posterior end, and slowly push the ovaries out (along with the other abdominal contents) with the other pair of forceps. Should this attempt fail, carefully remove the abdominal exoskeleton by inserting the forceps into the anterior end to release the ovaries. Using the forceps, hold an individual ovary by the opaque posterior end (i.e., the yolk-filled, late-stage eggs) and move it carefully to the third well of the dish for teasing to process it for live microscopy (step 3) or for fixing to perform immunostaining (step 7). Carefully tease the protective sheath from around the ovaries by sweeping a teasing needle lightly from the posterior to the anterior end of each ovary while holding it by the posterior end with a pair of forceps. NOTE: To minimize damage during teasing, bend the needle tip and zoom in on each ovary by increasing the magnification of the microscope (Figure 2A). Teasing should be effective enough to break the sheath, but it should also be carefully done to preserve the integrity of the ovarioles. NOTE: The tools required are depicted in Figure 2A. Before Drosophila dissection, prepare polyL-Lysine coated chambers. To this end, place two 20-µL drops of polyL-Lysine (0.1 mg/mL) on the coverglass (14 mm, No. 0) of a glass-bottomed petri dish (35 mm) at a reasonable distance from each other in order to prevent the merging of the drops. Air-dry the plates for 1 h at 37 ºC and mark the edges of the white polyL-Lysine film on the underside of the plate with an erasable marker. NOTE: The polyL-Lysine-coated chambers can be stored at 4 °C for a week. If using a previously coated chamber, bring it to room temperature before starting the Drosophila dissection. Set the scanning parameters on the confocal microscope to make sure that the sample can be imaged immediately after the completion of the dissection and mounting, as below. Place one dissected and teased ovary (following step 2 and stained, if required, following step 5) on a marked polyL-Lysine-coated region and spread the ovary with the teasing needle to separate the ovarioles. Place a 10-µL drop of insect dissecting medium on top of the ovary, making sure to cover the entire polyL-Lysine-coated area. Cover the petri dish. Immediately perform confocal microscopy of the mounted sample at room temperature. NOTE: Only one Drosophila should be dissected, processed, and imaged at a time. Also, microscopy should not be performed at 37 °C, which will mimic a heat shock environment for Drosophila tissue. NOTE: Mitochondrial matrix continuity in a fused mitochondrial structure is established after the complete fusion of the mitochondrial inner and outer membranes following a progression through the intermediate steps. Fission of mitochondria may follow the same steps but in the reverse direction (Figure 3A). FLIP is a time-lapse microscopy-based semi-quantitative method that can be used to assess mitochondrial matrix continuity in the final fused state of ex vivo mitochondria (steps 3 and 4 in Figure 3A) in live Drosophila ovaries9. The FLIP assay is performed as a small region of interest (ROI) of the mitochondria expressing a fluorescent molecule in the mitochondrial matrix that is photobleached at regular intervals (FLIP ROI in Figure 3A). As a result, any surrounding mitochondrial region that is continuous with the FLIP ROI (experimental ROI in Figure 3A) will lose signal due to the exchange of molecules in the continuous mitochondrial matrix. The FLIP experiments demonstrated here are performed on transgenic Drosophila expressing mitoYFP, which contains the mitochondrial targeting sequence of the human cytochrome oxidase VIII subunit tagged with YFP to target it to the mitochondrial matrix in a freely diffusible form. A similar experiment can also be performed with the mito pUASP-mito-GFP transgene, as reported previously9. A similar FLIP protocol may be used with a probe targeted to the mitochondrial inter-membrane space to be able to detect the continuity resulting from the fusion of the outer but not the inner mitochondrial membranes (step 2 in Figure 3A). Open the image acquisition software on the confocal microscope and set the appropriate scanning parameters in the "Acquisition" tab (Table 1). Check the "Time series," "Bleaching," and "Regions" boxes to open the individual tabs. Put the appropriate acquisition parameter values in each tab (Table 1). NOTE: The pinhole should be left open, as this experiment is designed to monitor overall signal from the whole mitochondrial population in individual cells. Use the eyepiece to quickly locate the field of interest in the mounted live tissue. NOTE: Select the ovarioles that are well spread on the glass-bottomed dish, since confocal microscopy cannot be performed on floating ovarioles. Click "live" to acquire a live image of the selected field of interest. Click "stop" to stop live scanning. If necessary, adjust the acquisition parameters such that the detected fluorescent signal is below the saturation levels (indicated by the absence of red pixels when the "range indicator" option is checked), with the defined background as set by adjusting the offset values. Draw a small ROI using the Bezier drawing tool from the "Regions" tab to demarcate the photobleaching zone on the image acquired by live scanning. NOTE: The size of the ROI should be around 20 - 50% of the total fluorescent mitochondrial signal within the cell. Perform the image acquisition by clicking on "start experiment." Quantify the fluorescence intensity using the proprietary or the open-source software (see Materials Table). Record the mean signal from the ROI where the repetitive bleaching is targeted (FLIP); the ROIs where bleaching has not been performed in the same cell (Experimental); the ROI from another unbleached cell in the same field of view, for assessing overall bleaching during the experimental period (Bleaching); and the ROI on the background area (Background). Subtract the mean background signal obtained from the mean signal in the other ROIs. Normalize the fluorescent signal with the initial pre-bleach signal for the respective cell. Plot the normalized data using any standard plotting software. NOTE: Steady-state mitochondrial structure and potential can be assessed using dyes that specifically incorporate into mitochondria in live cells and tissues. Live Drosophila ovaries can be stained ex vivo with fluorescent mitochondrial stains to visualize the mitochondria, to assess mitochondrial reactive oxygen species (mito-ROS) production, and to assess mitochondrial potential per unit mass. This can be accomplished by co-staining with the mitochondrial potentiometric dye tetramethylrhodamine ethyl ester (TMRE) and a compatible live mitochondrial stain representing the mitochondrial mass (see Materials Table for the specific dyes). Dilute the stock of the stains in warm insect dissecting medium to the final working concentrations: mitochondrial stain, 250 nM; TMRE, 50 nM; and mito-ROS stain, 5 μM. After dissection and teasing the ovaries following step 2, place the ovaries into 200 µL of any particular staining solution in a well of a dissection dish. Incubate them for 10 min with the dish covered by a suitable box wrapped with aluminum foil to protect it from light. Wash the stained ovaries by moving them carefully with forceps into 3 consecutive wells containing medium without stain. For co-staining with TMRE and the compatible overall mitochondrial stain, follow the above protocol to stain first with TMRE and then immediately with the overall mitochondrial stain (without any wash steps in between). Mount the ovaries on a polyL-Lysine coated glass-bottomed dish following step 3 and prepare for confocal microscopy with the appropriate scanning parameters (Table 1), following steps 4.2-4.4. NOTE: The signal from the incorporated dyes did not last when attempting to mount the stained samples in mounting medium. Check the Z-sectioning box to open the tab. Turn the focus wheel towards the bottom of the sample while it is being live-scanned and click on "set first" to define the bottommost Z-section. Do the same while moving the focus wheel towards the other direction to define the topmost section. Quantify the background-corrected fluorescent intensity from the ROIs for the background signal and the individual cells (as in step 4.7) and plot the data using any plotting software. NOTE: The clonal strategy used here introduces green fluorescent protein (GFP)-negative Drp1 null clones in the background of a GFP-positive, phenotypically wild-type background that is genotypically heterozygous for the Drp1 null mutation9. Heat shock-induced flippase-flippase recognition target (FLP-FRT)-mediated site-specific mitotic recombination creates homozygous clones of the functionally null drpKG03815 allele. The genotype of Drosophila carrying the Drp1 mutant is drpKG03815 FRT40A/CYO, whereas the genotype carrying the heat shock-induced FLP (hsFLP) and UbiGFP clonal marker is hsflp; ubiquitin nls-GFP (UbiGFP) FRT 40A/CyO. The genotype of the selected offspring of the cross between the above genotypes is hsFLP/+; drpKG03815FRT40A/UbiGFPFRT40A. Synchronize the Drosophila for virgin collection by moving them into new vials of fresh food every 2 to 3 days. Monitor the pupariating vials daily in order to collect emerging virgin females. Collect red-eyed, curly-wing virgin females from the Drp1 mutant genotype every day, once in the morning and once in the evening, and place them into a separate vial. In parallel, collect male Drosophila with dark red eyes and straight wings carrying hsflp and UbiGFP within 5 days of eclosion. Set up a cross by adding the males to the virgin females with a female:male ratio of 2:1. Sprinkle a small amount of granulated yeast to stimulate egg production. NOTE: Carefully move the Drosophila to a fresh vial of media every 2 to 3 days to increase the amount of progeny and to reduce vial crowding. Anesthetize, sort, and collect straight-winged, red-eyed female progeny within 5 days of eclosion. For the heat shock, place the collected Drosophila into empty vials with a small amount of granulated yeast and a small, soft wipe (to absorb the moisture during the heat shock). Place the vial with the Drosophila in a water bath at 38 ºC for 1 h, to generate primarily follicle cell clones, and at 37 ºC for 1 h twice a day (allowing at least 5 h between the 2 heat shocks) for 2 consecutive days, to generate both germline and follicle cell clones. NOTE: Make sure that the vial is completely submerged in the water up to the level of the plug. The heat shock may make the Drosophila immobile. Allow the heat-shocked Drosophila to recover for 1 h at room temperature when they become mobile again. Add the males back to the females in the same proportion as in the cross, and move them to fresh vials with medium sprinkled with a small amount of granulated yeast. Maintain the Drosophila for at least 5 days. Dissect the ovaries as necessary for a live or fixed experiment. NOTE: Ovaries isolated from the parental Drosophila expressing UbiGFP should be used as negative controls to confirm the efficient induction of GFP-negative clones by the heat shock. NOTE: To detect Drosophila Cyclin E (dCyclinE), we have used a commercially obtained antibody raised specifically against dCyclinE9 (see Materials Table). As a mitochondrial marker, we used an antibody against ATP-B (a subunit of the mitochondrial ATP synthase complex)9. Warm 4% paraformaldehyde (PFA) to room temperature, 25 °C. Caution! Paraformaldehyde is toxic. NOTE: After opening the ampule, PFA should be stored at 4 °C and used within 7 days. This is because storage of PFA may allow oxidation to methanol, which would dramatically alter mitochondrial membranes during fixation, even if present in trace amounts. Immediately after the dissection, fix the dissected ovaries by placing them in 200 µL of fresh PFA in a well of a glass dissecting dish (without teasing). Keep the dish in a fume hood for 15 min. Wash the fixed ovaries by moving them carefully with the forceps into 3 consecutive wells, each containing 200 µL of 1x phosphate-buffered saline (PBS). NOTE: The experiment can be stopped here and the samples can be left at 4 ºC for 1 day. Tease the ovaries more thoroughly in PBS (similar to step 2.6) to carefully remove the protective fibrous sheath that may hinder antigen access by the antibody. Permeabilize the teased ovaries by placing them in a microfuge tube with 500 µL of freshly made 0.5% PBS-Triton-X100 (PBS-TX) and incubate it for 30 min while rocking at 25 rpm. NOTE: During the rocking, place the tubes parallel to the rocking movement; placing them perpendicularly may allow the tissue to stick to the cap of the tubes, thus resulting in tissue loss. To remove the PBS-TX, place the microfuge tubes in a rack to allow the tissue to settle down at the bottom of the tubes. Inspect them visually and tap the tubes, if necessary, to bring any floating tissues down to the bottom. Aspirate the solution carefully from the top, making sure that the tissue at the bottom of the tubes remains undisturbed. Block the ovaries by adding 200 µL of 2% bovine serum albumin (BSA) dissolved in 0.5% PBS-TX, and incubate it on the rocker at room temperature for 1 h. Remove the blocking agent by following step 7.5. Add primary antibodies in 200 µL of fresh blocking agent: anti-rabbit dCyclinE antibody (1:100) and anti-mouse ATP-B antibody (1:100). Incubate the tissues on the rocker for 2 h at room temperature. Wash the ovaries with PBS-TX 3 times for 15 min each, following step 7.5. Add 200 µL of the appropriate secondary antibodies in fresh PBS-TX: anti-mouse-CY3 (1:1,000) and anti-rabbit-CY5 (1:500). Incubate on the rocker for 1 h at room temperature. To stain the DNA, add Hoechst (1:1,000 dilution) to the final PBS-TX wash. Finally, leave the tissue in 500 µL of 1x PBS. Using a 1-mL micropipette, remove the immunostained ovaries from the microfuge tube into a fresh well of a glass dissecting dish containing 200 µL of PBS. Add one drop of glycerol-based mounting medium to a glass slide and add the immunostained ovaries one by one to the mounting medium. NOTE: Make sure that the ovaries are indeed transferred to the mounting medium. Failing to do so will lead to tissue loss. While looking through the dissection microscope, gently pluck the transparent ovarioles (younger stages) from the opaque mature egg chambers using the teasing needle while holding the opaque portion of the ovary with the forceps. Remove the mature egg chambers from the mounting medium. Place a coverglass (22 mm, No. 1) on the slide and press lightly to ensure that the mounting medium is spread uniformly underneath. NOTE: Pressing on the coverglass also ensures the proper alignment of the tissue along the coverglass. Failing to do so optimally may allow the smaller stages to float in the mounting medium, preventing optimal microscopy of those tissues. Air-dry the samples for 15 min and seal the edges of the coverglass carefully with nail polish. Perform confocal microscopy as per experimental need (Table 1). The described methods can be used to study mitochondrial structure and function in live and fixed Drosophila ovaries (Figure 2B). Provided are some examples of anticipated results obtained with the described methods. Dissection of the Drosophila ovary: When dissected further, the severed abdomens (Figure 3B) from the whole Drosophila (Figure 3A) should release the abdominal contents, including 2 ovaries from each individual Drosophila. The intact ovaries appear as oval-shaped, white structures (arrows in Figure 3C and D) that ideally should remain attached to each other through the oviductal stalk. The ovarioles in each ovary should be held together by the fibrous sheath (# in magnified portion of Figure 3C), which is removed by careful teasing (thick arrow in Figure 3D; * indicating a badly teased ovary with detached ovarioles) to expose the ovarioles for staining and microscopy. The released ovaries with oviductal stalks torn during the release of the abdominal contents can also be used, provided they are not otherwise damaged. Any damaged ovaries (* in Figure 3C) and other abdominal contents (arrowhead in Figure 3C) should be discarded. Live microscopy of the Drosophila ovary: Here, we demonstrate the FLIP technique and the loading of mitochondrial structural and functional dyes in Drosophila ovaries. 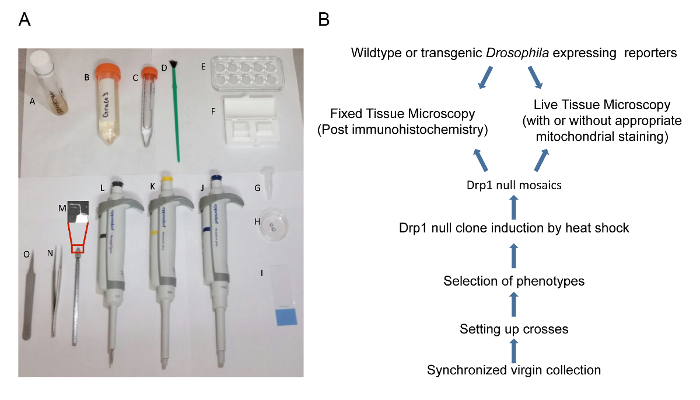 The FLIP technique, previously applied to assess mitochondrial continuity in the Drosophila follicle cells9, has been demonstrated here in the ovarian nurse cells of transgenic Drosophila expressing the mitochondrial matrix probe mito-YFP under a constitutive squash promoter. The FLIP protocol involving iterative photobleaching and intermittent recovery periods in the FLIP ROI allows for a loss of signal in the FLIP ROI, as well as in the surrounding regions if they are in continuity with the FLIP ROI (Figure 4A). FLIP targeted to one of the mitochondrial clouds associated with the nurse cells leads to a greater than 50% loss of the fluorescent signal from the blue and white ROIs surrounding the red FLIP ROI within 200 s (Figure 4B and C); the signal from the green ROI is used for background correction. The fluorescent signal from the yellow ROI in the other untargeted nurse cells remains constant throughout this time frame, signifying minimal overall bleaching during the time course of the experiment (Figure 4B, and C). Also, see Video 1. This result indicates that the mitochondria in nurse cells have fused their outer and inner membranes, exemplified in steps 3 and 4 (Figure 4A), while mitochondria in steps 1 and 2 are not expected to show any loss of fluorescence in this time frame. It has been previously demonstrated that a semi-quantitative measure of mitochondrial potential per unit mitochondrial mass can be assessed by co-staining with the potentiometric dye TMRE and the overall mitochondrial stain that reflects mitochondrial mass13. Here, the same technique was used to demonstrate the assessment of mitochondrial potential per unit mass in live Drosophila ovarian tissue. Confocal microscopy of live Drosophila ovaries stained with TMRE demonstrates a decrease in signal with the depth of the tissue (Figure 5A). This loss of fluorescent signal due to increasing scatter in greater tissue depth is expected to occur with any kind of fluorophore with a given working distance of the objective in use. Therefore, it is important to discern the maximal depth of the tissue within which the fluorophore can be detected during live tissue imaging. For example, live Drosophila ovaries stained with the overall mitochondrial stain (Mito) can be imaged using the described microscope setup (Table 1) within a range of 20 µm from the coverslip, while the maximum imageable depth decreases with increasing egg chamber size (Figure 5B). The optimized microscope settings for the mitochondrial stains detect positive signals in the appropriate detection channels, while the settings to examine any undue signal cross-talk or fluorophore cross-excitation expectedly detected minimal or no signal (Figure 6A). Co-staining of TMRE with the overall mitochondrial stain can be used for both qualitative (Figure 6B) and quantitative (Figure 6C and D) assessments of mitochondrial potential per unit mass in live Drosophila ovaries. For example, a) a qualitative analysis demonstrates that the Drosophila germarium exhibits higher mitochondrial potential per unit mass in stage 2b where the somatic follicle cells have arisen to encapsulate the germline cells (arrow heads in Figure 6B) and b) semi-quantitative analyses demonstrate the difference in mitochondrial potential per unit mass between (stretch) AFCs and the MBCs, as analyzed from a stage 9 egg chamber (Figure 6C). Note that the quantification has been performed from 2 different optical slices for AFCs and MBCs, depending on their plane of focus. The use of the mito-ROS probe that has been successfully used in Drosophila14 is demonstrated in live Drosophila ovarian epithelial follicle cell layers, where functional null clones of the mitochondrial fission protein Drp1were introduced. 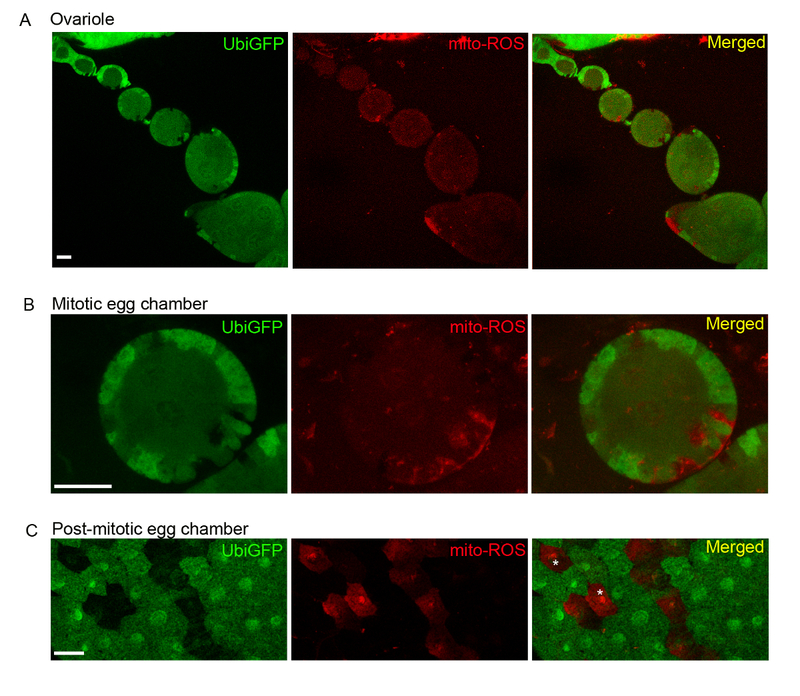 Most, but not all, of the live GFP-negative Drp1 null follicle cell clones exhibit elevated staining for mito-ROS (Figure 7A and B). Note that although a distinct mitochondrial signal could not be detected in this tissue, the concentration of the mito-ROS stain could be detected in the nuclear region in the advanced post-mitotic follicle cells, which are significantly larger than the mitotic follicle cells (* in Figure 7C). This may occur due to the interaction of nuclear DNA and the fluorescent oxidation product of the mito-ROS dye, which is a derivative of ethidium15. Detection of mitochondrial Cyclin E in fixed Drosophila ovarian follicle cells: It has been recently demonstrated that mitochondria can regulate the cell cycle molecule Cyclin E by recruiting it to the mitochondrial surface in mammalian cells and the Drosophila follicle cell layer12. Specifically, the repression of Drp1 enhances the mitochondrial Cyclin E pool in mammalian cells and the Drosophila follicle cell layer12. 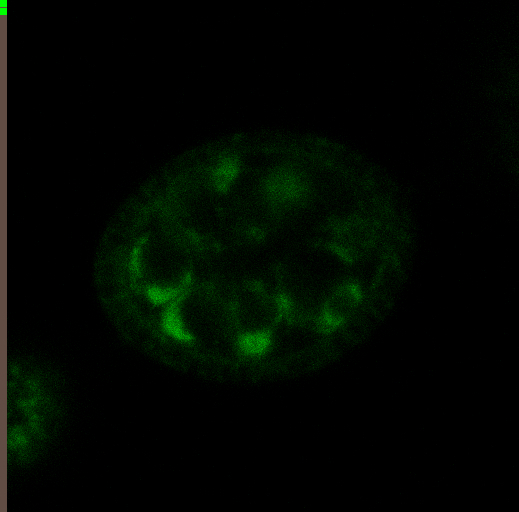 Here, an example of mitochondrial localization of Cyclin E in the Drosophila follicle cells is demonstrated using the co-immunostaining protocol described. Note the elevated levels of dCyclinE in the GFP-negative Drp1 null clones where the dCyclinE signal overlaps with that of the mitochondrial ATP-B signal in the germarium (Figure 8A), although the signal cannot be resolved into distinct mitochondrial elements with the limited resolution of confocal microscopy. Also, in post-mitotic MBCs, the GFP-negative Drp1 null clones have both nuclear and cytosolic dCyclinE signals, with the latter significantly overlapping with the ATP-B signal, whereas the wildtype GFP-positive cells only have a nuclear dCyclinE signal (Figure 8B). Figure 1. Development of the Drosophila Egg Chambers. Cartoon depicting a Drosophila ovariole consisting of a chain of developing egg chambers, each composed of an oocyte and the nurse cells (germline) encapsulated by the follicle cell layer (somatic). The egg chambers develop from the germarium and develop through stages where the mitotic follicle cells become post-mitotic. Please click here to view a larger version of this figure. Figure 2. Experimental Plan and Preparation. (A) Tools used in the methods described: A. Fly vial; B. Insect dissecting medium; C. Paraformaldehyde; D. Fly brush; E. Dissecting dish; F. Cover glass; G. Microfuge tube. H. Glass-bottomed dish; I. Glass slide; J. 1,000-µL micropipette; K. 200-µL micropipette; L. 2.5-µL micropipette; M. Teasing needle with a bent tip (tip is magnified); N. Thick forceps; O. Thin forceps. (B) A flow chart schematic representing the methods described. Please click here to view a larger version of this figure. Figure 3. Dissection of Drosophila Ovaries. (A) Anesthetized whole Drosophila. (B) Severed Drosophila abdomens with or without (*) the abdominal contents. (C) Released Drosophila abdominal contents, including the ovaries (arrows and *) and other contents (arrowheads); magnification of the boxed region on the right highlighting the anterior (Ant) and posterior (Post) ends of the pair of ovaries held by the oviductal stalk, where the ovarioles are held by the fibrous sheath (#). (D) Teased Drosophila ovary (thick arrow marking appropriately teased and * marking badly teased) in comparison to unteased ovary (thin arrow). Please click here to view a larger version of this figure. Figure 4. Live-tissue FLIP Assay. (A) Schematic representing the steps of mitochondrial fission/fusion, which can be assayed by an appropriate mitochondrial continuity assay using the FLIP method; in this case, a mito-YFP probe in the mitochondrial matrix allows for the assessment of mitochondrial matrix continuity. (B) Time-lapse ex vivo microscopy of a live transgenic Drosophila egg chamber expressing mito-YFP; only select time points (t) are shown. See Video 1 for all the time points. (C) Quantitation of the fluorescent signal from the respective colored ROIs in (B) are expressed after background correction and normalization. The arrowheads indicate the reiterative photobleaching time points, whereas the time interval between two consecutive bleaching events is the recovery time. Scale bar: 10 µm. The images were acquired with the parameters described in Table 1. Please click here to view a larger version of this figure. Figure 5. Live Mitochondrial Staining and Microscopy of the Drosophila Ovariole. (A) Individual optical slices of a live Drosophila ovariole stained with TMRE; the image was acquired with the parameters described in Table 1. Z denotes the distance from the coverslip in µm. (B) A live Drosophila ovariole loaded with the overall mitochondrial stain (Mito). The X-Z image of the red line in the X-Y image is shown, where B is the bottom and T is the top of the acquired image. The distance from the bottom to the blue line is 20 µm. Scale bar: 20 µm. The confocal images were acquired with the parameters described in Table 1. Please click here to view a larger version of this figure. Figure 6. Co-staining of live Drosophila Ovarioles with TMRE and the Overall Mitochondrial Stain. (A) Single optical slice of a live Drosophila ovariole co-stained with TMRE and the overall mitochondrial stain (Mito); * indicates an experimental artifact described in the Discussion section. (B) Maximum-intensity projection of 3 consecutive optical slices of the germarium in (A); arrowheads indicate the region where the TMRE fluorescence is increased. (C) Single optical slice of post-mitotic egg chamber co-stained with TMRE and the overall mitochondrial stain. The top and bottom panels show the plane of focus for AFCs and MBCs, respectively. (D) Box plot showing mean fluorescent intensity of TMRE and the overall mitochondrial stain quantified from individual AFCs and MBCs in the boxed regions in (C). The whiskers of the box plot indicate the maximum and minimum values for each group, excluding the outliers. (E) Box plot showing the ratio of fluorescent signal from TMRE and the overall mitochondrial stain in individual cells from (D). The whiskers of the box plot indicate the maximum and minimum values for each group, excluding the outliers. Scale bar: 20 µm. The confocal images were acquired with the parameters described in Table 1. Please click here to view a larger version of this figure. Figure 7. Staining of Live Drp1 Null Mosaic Drosophila Ovarioles with the Mito-ROS dye. (A) Single optical slice of ovarioles stained with the mito-ROS dye. (B) Maximum-intensity projection of 2 consecutive optical slices of an individual egg chamber with follicle cells in the mitotic stage stained with the mito-ROS dye. (C) Single optical slice of an individual egg chamber with follicle cells in the post-mitotic stage stained with the mito-ROS dye; * indicates a nuclear signal. The lack of UbiGFP marks the Drp1 null clones. Scale bar: 20 µm. The confocal images were acquired with the parameters described in Table 1. Please click here to view a larger version of this figure. Figure 8. Co-immunostaining of Fixed Drp1 Null Mosaic Drosophila Ovarioles with dCyclinE and ATP-B antibodies. (A) Maximum-intensity projection of 3 consecutive optical slices of co-immunostained germarium. (B) Maximum-intensity projection of 3 consecutive optical slices of co-immunostained post-mitotic MBCs. The outlines demarcate the UbiGFP-negative Drp1 null clones. Scale bar: 10 µm. The confocal images were acquired with the parameters described in Table 1. Please click here to view a larger version of this figure. Figure 9. Examples of Potential Damage and Artifacts. (A) Germarium of UbiGFP-expressing ovariole fixed and stained with the DNA dye Hoechst showing undue gaps (*). (B) Egg chamber of UbiGFP-expressing ovariole fixed and stained with the DNA dye Hoechst showing nicks/tears (*). (C) Live ovariole with UbiGFP-negative Drp1 null clones stained with the mito-ROS dye showing a deformed chamber (*) and a damaged egg chamber, allowing partial staining of the germline (**); # denotes a possibly real stain of an undamaged egg chamber in the same ovariole. (D) Live ovariole stained with the mito-ROS dye showing an overall damaged chamber with intense artifactual staining of the germline. * indicates damage-induced flattened ovarioles with a loss of UbiGFP signal, thus giving rise to artifactual GFP-negative clones. Scale bar: 20 µm. The confocal images were acquired with the parameters described in Table 1. Please click here to view a larger version of this figure. Photobleaching: Preventing undue photobleaching of fluorescent samples is absolutely necessary to performing efficient confocal microscopy. Therefore, the time used to locate samples through the eyepiece or to set image acquisition parameters through the live scanning mode should be minimized to minimize photobleaching. 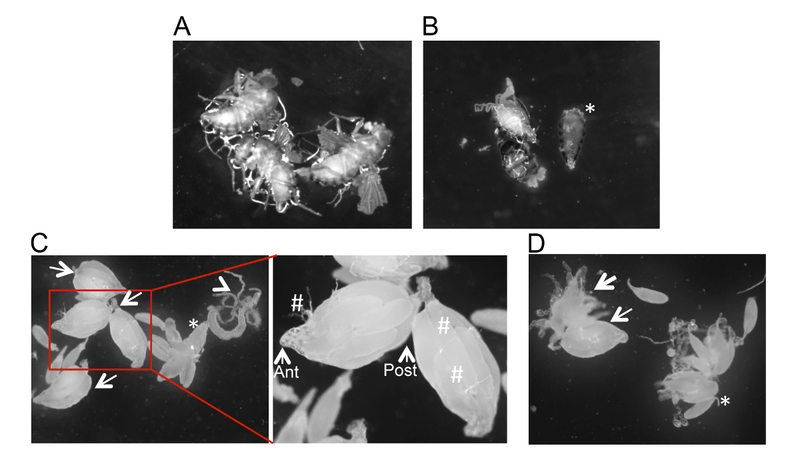 Tissue damage: Since mitochondria are considered to be the sensors of cellular health, it is extremely important to ensure that the data obtained using the described methods are physiologically relevant and do not reflect the undue damage caused by the procedural dissection of the Drosophila ovaries. The dissection should be performed as quickly as possible, but also with extreme precaution to minimizing tissue damage. The average time for the dissection and teasing of 5 Drosophila ovaries is 5 to 7 min (in our hands). Effort must be taken to identify egg chambers showing damaged tissue that will be excluded from the analyses. Tissue damage due to dissection may include undue gaps (* in Figure 9A, as identified by the lack of signal), nicks/tears (* in Figure 9B, as identified by the lack of signal), or deformation of the egg chambers (* in Figure 9C). However, any meaningful chamber deformation arising from the experimental manipulation should be carefully evaluated. Although no coverslip is used on top of the live tissue in the protocol described, flattening of the ovarioles may occur with undue pressure applied to the tissue while teasing or mounting (* in Figure 9D). The flattening of ovarioles has not been observed with fixed samples, since the protocol described involves the fixing of tissues immediately after dissection, with teasing occurring thereafter. Any isolated egg chamber without any signatures of the aforementioned damage may be considered normal. Mechanical damage potentially resulting from dissection may also lead to the loss of GFP, yielding false GFP-negative clones16, and can also give rise to enhanced dye incorporation. 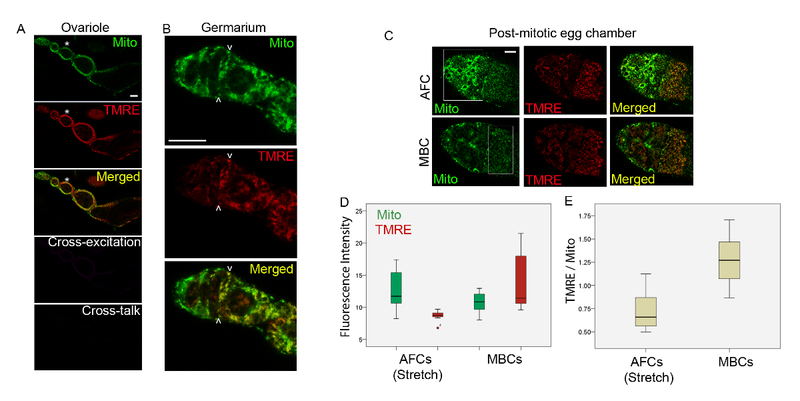 Given that the germline cells residing inside the egg chambers are not normally permeable to the live mitochondrial dyes (Figures 6 and 7), the enhanced mitochondrial staining of the Drosophila germline cells may result from an increase in the permeability of the damaged/dying tissue; such an artefact occurs with the mito-ROS dye (** in Figure 9C and the whole ovariole in Figure 9D), as well as with other live mitochondrial stains (not shown). The loss of UbiGFP in Figure 9D (*) could also result from damage that caused the flattening of the egg chambers. Although other egg chambers in the damaged ovariole may remain authentic and artifact free (# in Figure 9C), it is best to exclude the whole ovariole from the analyses. Similar damage can also allow augmented access of antigens to the antibodies during the immunostaining procedure, resulting in a significant increase of immunostaining in the damaged zones. Therefore, the egg chambers with enhanced live or immunostaining in comparison to the rest of the population should be excluded from the analyses. Time sensitivity: In the case of live ex vivo microscopy, the data should be obtained within 15 min of tissue mounting; otherwise, the experimental results may be affected by alterations of physiology due to the ensuing death of the tissue. Sometimes, depending upon the laser power and other scanning parameters, the 10 µL of mounting medium may evaporate sooner than 15 min. The detection of the mitochondrial Cyclin E pool by co-immunostaining requires the minimization of dissection time (likely due to the transient nature of the mitochondrial Cyclin E pool that is maintained by active mitochondrial respiration12). An appreciable mitochondrial Cyclin E pool was also not observed with permeabilization times less than 30 min. FLIP: The movement of any egg chamber under examination during the FLIP time course may lead to artifactual analyses and thus must be excluded. The use of any live mitochondrial dyes or TMRE is not recommended in a FLIP experiment, since incorporation of the foreign dye may alter the mitochondrial continuity and thus lead to artifactual results. Drosophila crossing strategy: The cross reciprocal to the one described here (where males carrying the Drp1 mutant allele are used) does not yield many offspring, likely due to an unidentified impact of Drp1 repression in the heterozygous male parents. Interpretation of clonal data: Any GF-negative clones detected in the control ovaries isolated from the parental Drosophila expressing UbiGFP would indicate artifactual false-negative clones, likely generated due to GFP loss caused by damage during the dissection16. Nonetheless, the number of GFP-negative clones in the heat-shocked progeny of the cross should be significantly higher than any false-negative clones seen in the controls. The clones generated in the Drosophila follicle cell layer by the described mitotic recombination-based strategy can arise from the mitotic follicle stem cells (stem cell clones) or from the mitotic non-stem follicle cells (transient clones). For stem cell clones, the experimental analyses should be performed only 10 days after the heat shock, when the egg chambers with the transient clones have already been laid. For transient clones, the analyses should be performed within 6 days after the heat shock, with the follicle cell clones of the ovarioles without any follicle cell clone in the germarium. While assessing mitochondrial potential per unit mass using the described method, one has to be aware of potential artifacts arising out of the microscope optics or mitochondrial dye combinations. Any region showing a weakened signal from the overall mitochondrial stain and a comparatively elevated TMRE signal (Figure 5A, *) may arise due to fluorescence resonance energy transfer (FRET) between the dyes8 or due to different optical properties of the red (TMRE) and green (overall mitochondrial dye) fluorescent lights, given a fixed pinhole size in the acquisition setup. The FRET-related artifact could be avoided by reducing the dye concentrations, if possible, while quantitative analyses can be performed on projections of 2 - 3 consecutive optical slices to avoid the optical artifact. Also, if a fluorescent signal is detected in the crosstalk and cross-excitation channels, the laser and detector settings must be readjusted to minimize the signal in these channels, which is expected to reduce the fluorescent signal in the optimal channels as well. Laser-induced damaged from the reiterative photobleaching may cause mitochondrial fragmentation and thus cause mitochondrial discontinuity, preventing a successful FLIP. Suspected fragmentation of mitochondria during the execution of the FLIP protocol can be identified by acquiring higher-resolution images with a reduced pinhole (and enhancing the detector gain). If fragmentation of mitochondria is visibly noticed during the execution of the FLIP protocol, the power of the bleaching laser must be reduced and/or the interval between consecutive bleaches must be increased. If there is overall bleaching during the time course of the FLIP experiment (signal from the yellow ROI in Figure 3B and C), the scanning laser must be readjusted to a level that allows minimal or no overall photobleaching. To avoid the potential artifact due to damage-induced loss of GFP, GFP-positive clones can be introduced using the MARCM strategy, following the described heat-shock protocol. Here, the appropriate Drosophila to be used for the cross is virgin female drpKG03815 FRT40A/CYO X male Gal80 FRT 40A/CyO; tub-Gal4, UAS-CD8GFP/TM69. The straight-wing progeny should be used for clone generation using heat shock (as described in step 6). A) While the follicle cells residing on the surface of the live Drosophila egg chambers incorporate the mitochondrial staining dyes, the germline cells inside the egg chamber fail to do so; the germline of the younger stages stain weakly (Figures 5 and 6). B) The live ex vivo tissue microscopy must be performed within 15 min of completion of the staining on ovaries isolated from individual Drosophila, one at a time. Since experimental groups should be processed and imaged on the same day, the total time taken to obtain statistically significant data from live ex vivo tissue microscopy from various experimental groups is reasonably longer than those obtained from fixed tissues. C) We noted that the mito-ROS stain was not very stable in the ex vivo Drosophila tissue, likely due to the transient nature of the ROS analyte it detects17,15, which may underlie the lack of detection of signal from all the Drp1 null clones. However, any biological relevance of the variability in mito-ROS staining in the Drp1 null cells/clones cannot be ruled out and must be investigated further. Note that the positive signal from the mito-ROS stain may not just reflect enhanced superoxide but also the enhanced mitochondrial or cellular oxidative environment15. D) The overall mitochondrial stain cannot be used for the GFP-negative or GFP-positive clonal experiments, since the fluorescent spectrum of this mitochondrial stain and GFP are indistinguishable. E) The FLIP experiment designed to assay mitochondrial matrix continuity would require image acquisition with an open pinhole that encompasses the resolution of the mitochondrial structures. Studying the mitochondrial structure-function relationship is crucial for a thorough understanding of the regulatory mechanisms of mitochondrial functionality. Because mitochondrial defects significantly contribute to various diseases, including diabetes, cancer, Parkinson's disease, a detailed understanding of the mitochondrial modus operandi holds the promise of facilitating the development of mitochondria-directed therapeutic strategies. Live-cell microscopy is an indispensable tool for studying the mitochondrial structure-function relationship. However, most of these studies have been restricted to isolated cells. The study of mitochondrial structure and function has been extended to live Drosophila tissue in an ex vivo setup9. The described protocol of this and related studies will lead to an understanding of mitochondrial structure and function in live Drosophila ovaries, ex vivo, allowing an understanding of mitochondria in a physiological context. This ex vivo approach has significant advantages over in vitro studies, since the regulation of the metabolic and energetic properties of mitochondria in a given cell is largely dependent upon the nutrient availability and appropriate signaling in the physiological context of the cells. Genetic manipulation of mitochondrial structure by repressing the mitochondrial fission protein Drp1 deregulates the cell cycle modulator Cyclin E and affects the development of the Drosophila ovarian follicle cell layer9,12. Here, the protocol includes a description of how to introduce functionally null clones of Drp1 in the Drosophila ovaries to study the mitochondrial structure-function relationship. A novel pool of mitochondrial Cyclin E on mammalian cells, as well as the Drosophila follicle cell layer12, has been successfully detected, which likely underlies the reported Cyclin E regulation by mitochondria18. Here, the manuscript demonstrates a method for detecting the novel mitochondrial Cyclin E pool by co-immunostaining fixed Drosophila ovaries for dCyclinE and a mitochondrial marker (ATP-B). Given that Drosophila melanogaster is a powerful genetic model system, our described methods are anticipated to contribute significantly to the understanding of the genetic basis of the mitochondrial structure-function relationship in health and disease. Drosophila has been widely used to tease out the genetic interactions leading to tumorigenesis19. The capability of the generation of clones in the Drosophila epithelial follicle cell layer allows the study of the interaction of mitochondria and oncogenes or tumor suppressors in individual tumorigenic clones in an in vivo and ex vivo setup. The described methods can be used to study the regulation of the mitochondrial structure-function relationship on ovaries isolated from appropriate mutant Drosophila. The described methods can be further extended to study the direct impact of various nutrient and growth factor signaling on mitochondrial structure and function through the exogenous addition of the appropriate nutrients and/or growth factors in the ex vivo imaging medium. The described methods can be appropriately modified and employed in other isolated Drosophila tissues, like the larval imaginal discs, which have been widely used to study signal transduction pathways in diseases like cancer20,21. We acknowledge Leena Patel and Diamond Woodard for helping in the Drosophila medium preparation and Dr. Igor Chesnokov for providing access to the camera-attached stereomicroscope. Nunnari, J., Suomalainen, A. Mitochondria: in sickness and in health. Cell. 148, (6), 1145-1159 (2012). Youle, R. J., van der Bliek, A. M. Mitochondrial fission, fusion, and stress. Science. 337, (6098), 1062-1065 (2012). Mitra, K. Mitochondrial fission-fusion as an emerging key regulator of cell proliferation and differentiation. Bioessays. (2013). Kageyama, Y., Zhang, Z., Sesaki, H. Mitochondrial division: molecular machinery and physiological functions. Curr Opin Cell Biol. 23, (4), 427-434 (2011). Chen, H., Chan, D. C. Physiological functions of mitochondrial fusion. Ann N Y Acad Sci. 1201, 21-25 (2010). Liesa, M., Shirihai, O. S. Mitochondrial dynamics in the regulation of nutrient utilization and energy expenditure. Cell Metab. 17, (4), 491-506 (2013). Hoppins, S. The regulation of mitochondrial dynamics. Curr Opin Cell Biol. 29, 46-52 (2014). Mitra, K., Lippincott-Schwartz, J. Chapter 4, Analysis of mitochondrial dynamics and functions using imaging approaches. Curr Protoc Cell Biol. Chapter. 21-21 (2010). Mitra, K., Rikhy, R., Lilly, M., Lippincott-Schwartz, J. DRP1-dependent mitochondrial fission initiates follicle cell differentiation during Drosophila oogenesis. J Cell Biol. 197, (4), 487-497 (2012). Klusza, S., Deng, W. M. At the crossroads of differentiation and proliferation: precise control of cell-cycle changes by multiple signaling pathways in Drosophila follicle cells. Bioessays. 33, (2), 124-134 (2011). Sahai-Hernandez, P., Castanieto, A., Nystul, T. G. Drosophila models of epithelial stem cells and their niches. Wiley Interdiscip Rev Dev Biol. 1, (3), 447-457 (2012). Parker, D. J., et al. 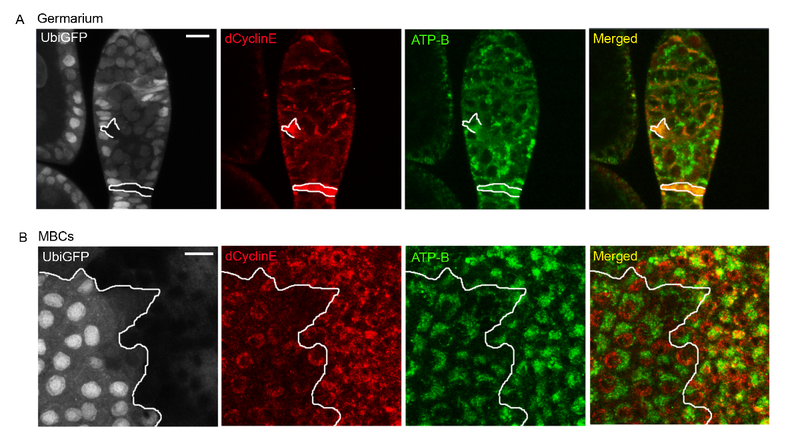 A new mitochondrial pool of cyclin E, regulated by Drp1, is linked to cell-density-dependent cell proliferation. J Cell Sci. 128, (22), 4171-4182 (2015). Mitra, K., Wunder, C., Roysam, B., Lin, G., Lippincott-Schwartz, J. A hyperfused mitochondrial state achieved at G1-S regulates cyclin E buildup and entry into S phase. Proc Natl Acad Sci U S A. 106, (29), 11960-11965 (2009). Shidara, Y., Hollenbeck, P. J. Defects in mitochondrial axonal transport and membrane potential without increased reactive oxygen species production in a Drosophila model of Friedreich ataxia. J Neurosci. 30, (34), 11369-11378 (2010). Zielonka, J., Kalyanaraman, B. Hydroethidine- and MitoSOX-derived red fluorescence is not a reliable indicator of intracellular superoxide formation: another inconvenient truth. Free Radic Biol Med. 48, (8), 983-1001 (2010). Haack, T., Bergstralh, D. T., St Johnston, D. Damage to the Drosophila follicle cell epithelium produces "false clones" with apparent polarity phenotypes. Biol Open. 2, (12), 1313-1320 (2013). Murphy, M. P. How mitochondria produce reactive oxygen species. Biochem J. 417, (1), 1-13 (2009). Mandal, S., Guptan, P., Owusu-Ansah, E., Banerjee, U. Mitochondrial regulation of cell cycle progression during development as revealed by the tenured mutation in Drosophila. Dev Cell. 9, (6), 843-854 (2005). Tipping, M., Perrimon, N. Drosophila as a model for context-dependent tumorigenesis. J Cell Physiol. 229, (1), 27-33 (2014). Herranz, H., Eichenlaub, T., Cohen, S. M. Cancer in Drosophila: Imaginal Discs as a Model for Epithelial Tumor Formation. Curr Top Dev Biol. 116, 181-199 (2016). Pandey, U. B., Nichols, C. D. Human disease models in Drosophila melanogaster and the role of the fly in therapeutic drug discovery. Pharmacol Rev. 63, (2), 411-436 (2011).